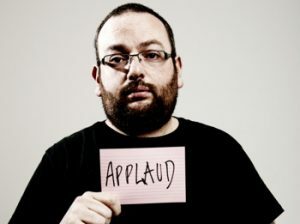 David Trent elbowed his way into comedy at the 2012 Edinburgh Fringe Festival with his first show ‘Spontaneous Comedian’, an intelligently depicted yet hilariously explosive observation of modern day pop culture. He wowed audiences and critics alike with his tech heavy hilarity and high octane audiovisual onslaught, selling out the full month and was nominated for the highly prized Foster’s Comedy Best Newcomer Award. Further recognition quickly followed with a run at the Soho Theatre and a nomination for Chortle’s Best Breakthrough Act.